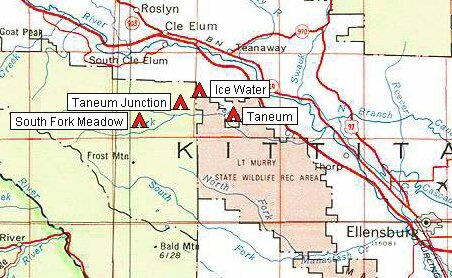 The Taneum Campground Area Map shows the locations of the South Fork Meadow, Taneum Junction, Ice Water and Taneum campgrounds within the Okanogan-Wenatchee National Forest. Map created with TOPO! ©2000 Wildflower Productions (www.topo.com).